A boat breaks rule 18.3 at the finish line when she causes a boat who has been on starboard tack since entering the zone to sail above close hauled to avoid contact. Approaching a windward finish line, Blue on port passes head to wind inside the zone of the port end finishing mark, and then luffs above close-hauled to finish. Green has to luff above close-hauled to avoid contact, and protests. Did any of the boats break a rule? Blue broke rule 18.3 when she caused Green, who has been on starboard tack since entering the zone, to sail above close hauled to avoid contact. Although after finishing a boat need not cross the finishing line completely, until they finish both boats are required to leave a finishing mark on the same side, therefore rule 18 applies. 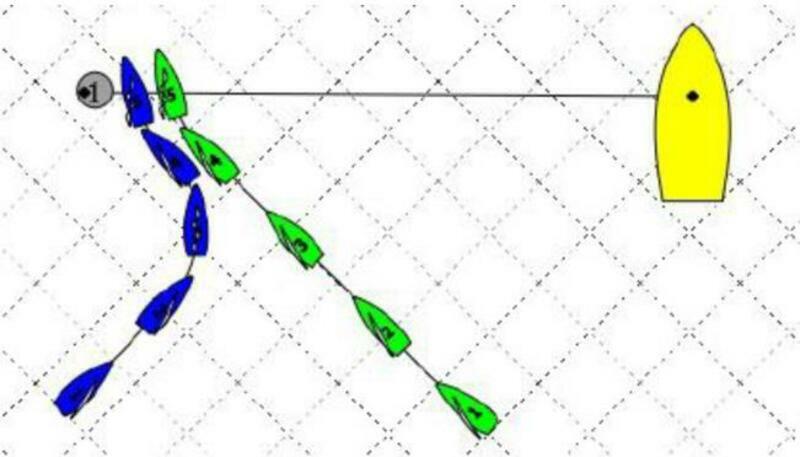 When Blue passes head-to-wind from port to starboard tack inside the zone, and is then fetching the port end finishing mark, rule 18.3 applies between her and Green.